IISC’s trainings provide participants with the opportunity to learn and practice the skills and tools of collaboration so that they can design meetings, build and run organizations and networks with greater social impact. If you have questions about our workshops and/or the workshop registration process, please review these FAQs. If after doing so your question remains unanswered, we’d be happy to hear from you. Please contact us at workshops@interactioninstitute.org. A one day workshop for operationalizing racial justice in day-to-day organizational life. Join us for this two-day learning laboratory where we will experiment with a variety of ways to help people connect in authentic ways that yield productive conversations and solid agreements. 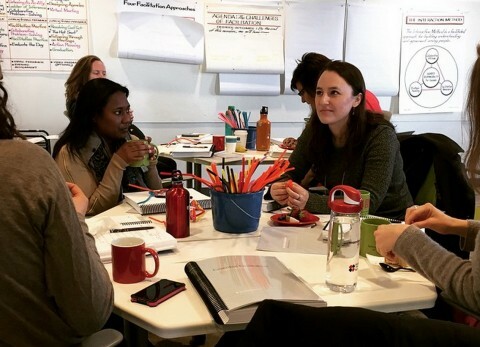 In this three-day facilitation intensive, you will learn the essential strategies and skills for helping groups solve problems, resolve conflict, and build agreement. Led by expert practitioners, this workshop will provide you with a solid foundation of facilitation theory and practice for immediate use. This workshop will give you tangible tools to do what you’ve always wished you could do better: marry your heart and your mind in leadership. This training showed me how to blend emotional intelligence, empathy, social justice, honesty, reflection, and inquiry into pragmatic models with real outcomes. The best of both worlds! … being an efficient leader who cares what others bring to the table and inspires them for the best possible outcome.